Hello! 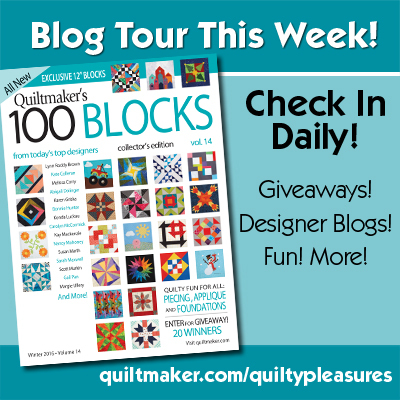 Welcome to the Quiltmaker's 100 Blocks Volume 14 Blog Hop! 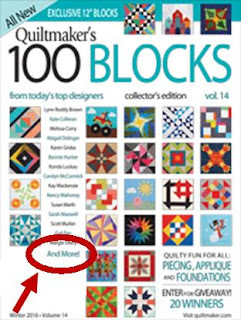 My block and name are not technically on the cover, but I am included in an elite group of designers knows as the "And More!" club! I love red, white, and blue quilts! 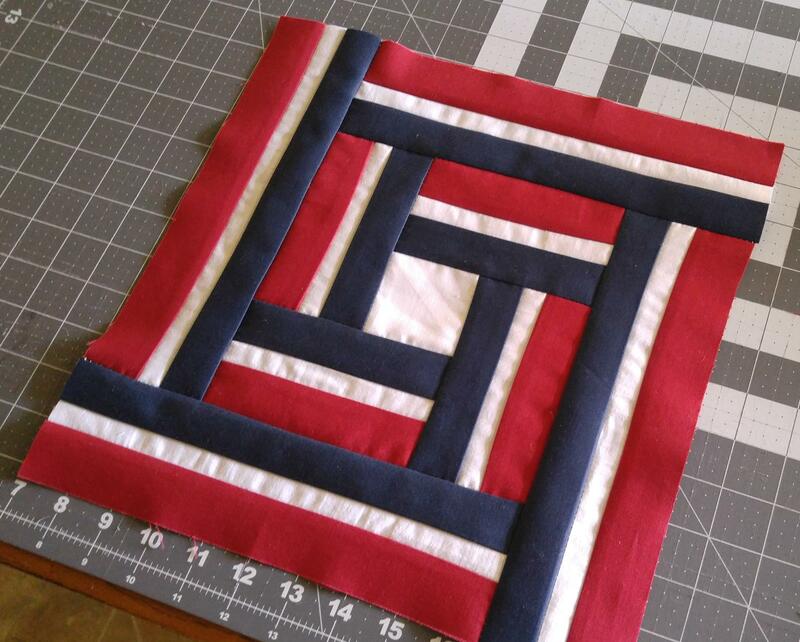 I made a Quilt of Valor earlier this year (read about it here). 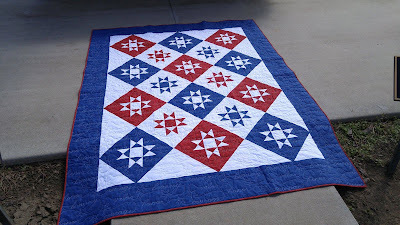 And thanks to Quiltmaker, I'm now dreaming and scheming about starting a new red, white, and blue quilt! I love the miracle of technology and how quickly you can see different colors and layouts for a quilt pattern! (I use EQ7.) 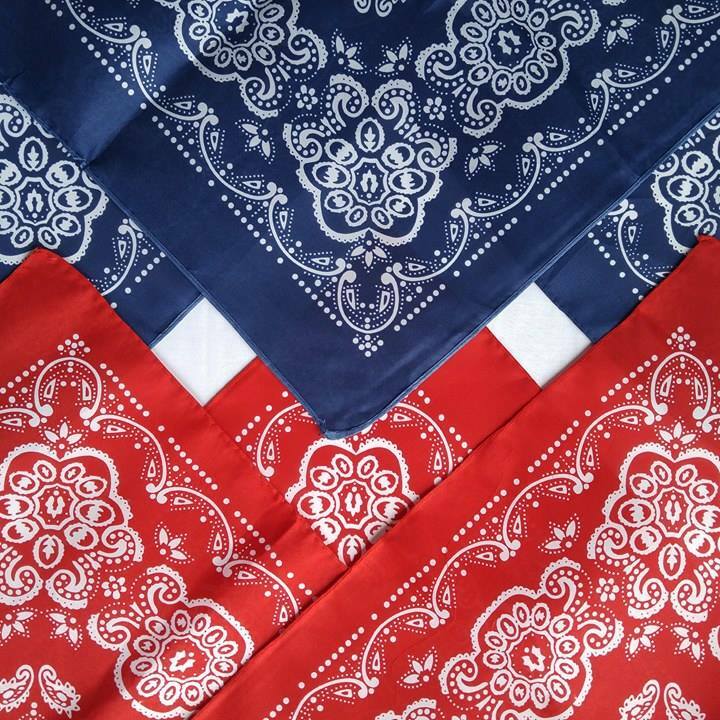 Here are just a few of the red, white, and blue quilts I came up with using my block. 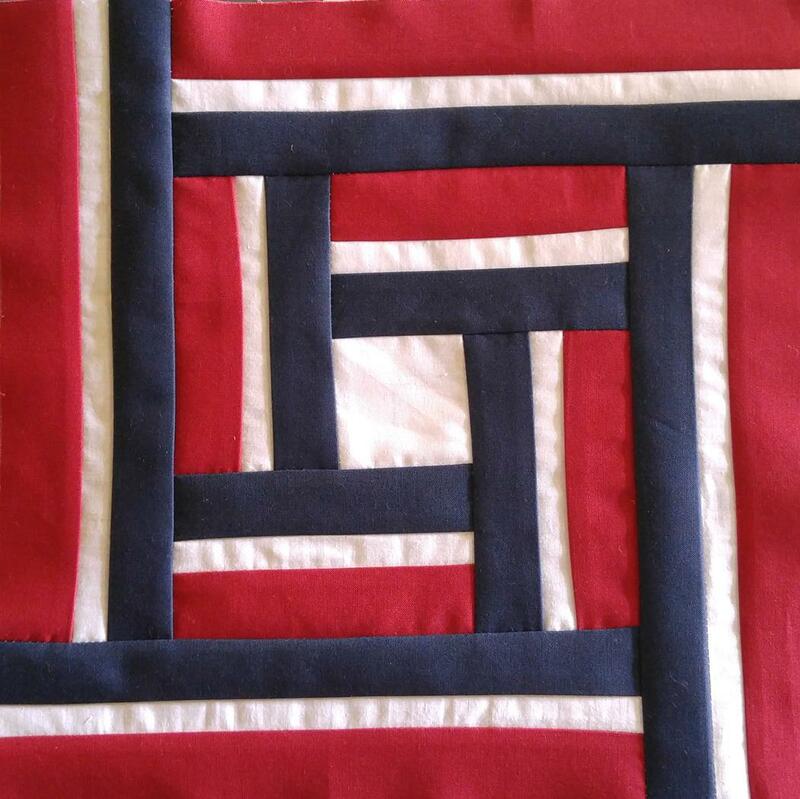 Traditional setting, but half of the blocks sewn so they are "flipped." Two borders. Blocks are set on point with half of the blocks sewn so they are "flipped." Two borders. It never ceases to amaze me how different a quilt can look in different fabrics. So I recolored the block to see what would happen. Changing the red to turquoise changes the look entirely! Christmas! Wouldn't this look great with fussy cut centers?! Blocks are set on point and half of the blocks sewn so they are "flipped." Same layout as above, just different colors! Head over to Quiltmaker's QuiltyPleasures Blog to see all the designers that are participating in the blog hop! There are giveaways on every stop! There are actually THREE giveaways happening right here, right now! Giveaways now closed. 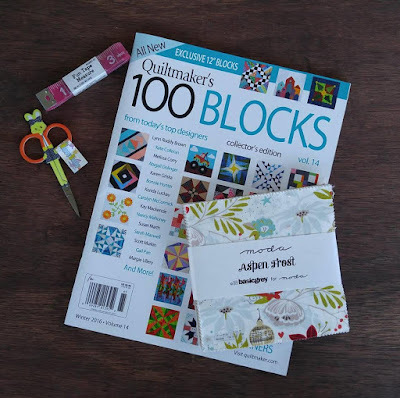 Two additional readers will each receive a copy of the magazine, a tape measure, a pair of tiny scissors, a charm pack of Aspen Frost by Basic Grey for Moda, and a print copy of one of my quilt patterns! To enter the giveaways, leave a comment on this post telling me your favorite Thanksgiving food. Giveaway closed. Since I know you're dying to know mine, I absolutely love leftover turkey sandwiches. Regular sandwich bread, Miracle Whip, and turkey is delicious, but hoagie bread, mayo, cranberry sauce, stuffing, and turkey is out of this world! Giveaway will be open through the end of the blog hop. Giveaway will close at 11:59pm on November 18th. Be sure to follow my blog (enter your email in the "follow by email" box in the right sidebar) and find me on Facebook/Instagram/Ello to keep up with my latest antics and quilt finishes! (34 so far this year!) Can't wait to see you there! Dressing! The holidays are the only time all year that I will eat stuffing. Leftovers always taste so much better! A super design, and as I'm way down in New Zealand, maybe do not qualify for the wonderful give-away. Just in case, we don't celebrate Thanksgiving here, but I do have a cranberry bush, and each summer, make delicious jelly. So if celebrations were to happen, by chance, our own jelly would be the perfect trimming for a turkey roast. Great design! I love candied sweet potatoes for Thanksgiving. I love the non-traditional foods that our family has made traditional at our Thanksgiving feasts, enchilada casserole and brisket are a couple of such items!! I'm so excited for you and if I ever see that magazine on a store shelf I'll act the same way and send you pictures!! Congrats, Heather! You are the winner of a magazine and charm pack prize! Email me to claim your prize, and I'll mail it out right away! My favorite Thanksgiving food is pumpkin pie made with my grandmother's recipe. It's almost a pumpkin custard, very light and yummy. My favorite is the cranberry orange nut bread I eat while I watch the parades. My favorite is also the stuffing. The only turkey sandwich I like is hot with bread and gravy. Turkey leftovers are my favorite--I make a turkey and wild rice casserole that is so good we buy and extra turkey so we'll have more leftovers to make it! Stuffing is my favorite, along with sweet potato casserole. I love sweet potato casserole definitely with pecans on top. Then for desert apple bread pudding. Forget the turkey, it's just a vehicle to get to the Pumpkin Cheesecake! Sweet potatoes are my favorite Thanksgiving food, with gravy and cranberry sauce mixed in. Congrats Laura, on your first publication. I too, have a block in this issue! Love the block and all the different ways to use it. Pumpkin Pie is my favorite Thanksgiving food. Thanks for the giveaway! Congrats! We make our sweet potatoes into chips and those are my absolute favorite! Congratulations. Such a fun block. 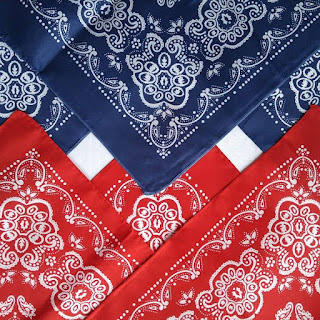 I love the red/white/blue patterns. My favorite growing up was Moms homemade bread. Now that she is gone and neither my sister or I can seem to duplicate her bread, it is now mashed sweet potatoes. That's a great block! One of my first quilts had partial seams, and they're very simple. My favorite Thanksgiving food is pumpkin pie! Lefse, lefse, lefse!!! Especially filled with turkey or meatballs!! Cranberry sauce made from scratch! I have 2 favorites. Dressing - just like my mom used to make. And cranberry relish using my grandmothers recipe - the one with oranges & apples crushed up with the cranberries - YUM! My favorite Thankgiving food iegreen bean casserole and homemade noodles. I love the way your blocks can create a woven design. Congrats on your joining the "and more" crew :) Turkey. Definitely turkey. And turkey leftovers of all descriptions! I love your block set on point. My favorite food for Thanksgiving is turkey. Thanks for the chance to win. Love your block and how different it looks in each of the different color ways. My favorite food is the turkey dressing. Thanks for sharing your block with us. Your block is fantastic! I would have to do it in purples...oh how I love purple! And speaking of love...you and I are leftover turkey sandwich twins! That is one of the reasons I make the full on turkey dinner for me and the one or two people who eat it with me...lots of leftovers means that I get the sandwich for breakfast lunch and dinner for the next week! YAY! My favorite!!! Loved your block and ALL of the layouts you showed. It's so versatile! I'm a big fan of pumpkin pie with whipped cream!! I love the on-point blocks - it gives the illusion of weaving! I love mashed potato casserole and sausage stuffing! We love the Turkey with gravy! Thanks for sharing! I love sweet potato casserole! The quilts made out of your blocks are stunning! I'm definitely putting this on my to-do list. My favorite is pumpkin pie but the turkey sandwich with cranberry sauce is second. I love leftover turkey sandwiches, too, but my favorite is cornbread dressing. Great block, congratulations! Oh those turkey and miracle whip sandwiches are to die for, well kind of. I grew up on those leftovers. BUT my favorite on the table are the yams. Yes seconds of those for me. Ok, I admit I was one of the groans. I love quick and easy, but I did get motivated by your blog- I'm all in. I love pumpkin pie, I like to make my own pumpkin puree and even tho I said "quick and easy" I make my own special pie crust recipe. My morning is traditionally turkey in oven,sit down with a piece of pie(including home whipped cream) and The parade. I love sweet potatoes and pecan pie, and turkey and dressing and giblet gravy and pumpkin pie and cranberry sauce and and and...Thanks for the chance to win, with Hasting's closed I have no where to pick the magazine up at anymore. I love the stuffing! And for leftovers a recipe called turkey wreath! My favorite Thanksgiving food is the turkey--especially the leftovers. My favorite is turkey AND oyster dressing! My fav is the cranberry sauce. Apparently, I'm pretty good at making it too. It's the only thing that other hostesses request I bring. Congratulations on an exciting block! I especially like how your blocks look with half of them flipped, with two borders... Both in a traditional setting, and in an on point setting!! ...Gives them an intriguing woven look, with depth! My favorite Thanksgiving food is the way my (grown) children make mashed potatoes! (I always loved to cook, "from scratch", and am so happy that all of my children also love it... And are better than I am!). They created a way to make mashed potatoes in a pressure cooker with sweet potatoes *and* gold potatoes, that is *amazing*!!! I love all the different looks for your block. My favorite Thanksgiving food is the turkey! Especially when it was raised by my sister-in-law! I love turkey - I'm determined to raise my own one year! My favorite Thanksgiving food is the dumplings my sister makes and pecan pie that my niece bakes. Every year they request that I make my cheesy potatoes and I usually don't have any to take home. Definitely butternut squash soup! We only make it this time of year and it just speaks to my soul.thanks for the awesome giveaway! It's the stuffing. But since I've been dieting for a good part of a year now, I may be down to just a taste. No bread (or very little) for a while now. But it's working! Secret recipe for pumpkin pie is our family Thanksgiving fav. I liked your block but began to LOVE it after seeing the enticing setting ideas! I like the last blue and white layout the best. It looks 3 dimensional to me. Your block is fantastic looking. Usually, the blocks in the issues are ones I would never make. Thanks for showing us the different ways it can look. Food for Thanksgiving? I love turkey, any time I can get it! Yum! Congratulations on being in the magazine! I've enjoyed every issue I've gotten. As for Thanksgiving, I'm all about the stuffing. Made just the way my Mom used to. I always make more than we could possibly eat on Thursday, so I will have days of leftovers. Unfortunately, I didn't hear from you within 7 days, so I have to draw a new winner. Try again next time! Congratulations on being published! I love the on-point setting for your block! I also love leftover Turkey sandwiches. Regular Bread, Miracle Whip, and lots of black pepper! My favorite Thanksgiving food is scalloped corn. My mom made the best and I was sure to have her show me how before I moved out as an adult! Anyway, I am not afraid of partial seams and love the different layouts you've shown. Thanks for sharing your inspiration with us. cknapp3626(at)sbcglobal(dot)net. My favorite Thanksgiving food is the potatoes. They always taste better on Thanksgiving day!! Thanks. Love all the different layouts and secondary patterns created when the blocks are put together. Well, I kinda love it ALL! Leftovers are great too. I am Dutch, so no Thanksgiving over here. Your block looks a bit Dutch,the red, blue and white. Love it. Thanks for the chance. Love your block, especially the on point! My favorite is my mom's dressing! How exciting to be in this magazine congrats. I love your block...I really like the red and green layout. It's really hard to pick just one favorite Thanksgiving dish but I guess the Dressing with gravy and cranberry sauce on it is the best. I love the turkey but can't pass up the homemade butterscotch pie. My favorite is also the turkey with cranberry sauce sandwich eaten the next day. Love me some pumpkin pie!! With tons of whipped cream. Sweet potato casserole with pecans and coconut on top. Turkey soup made from the bones/bits and pieces of leftover meat. I love all the different layout versions and colorways you have shown. 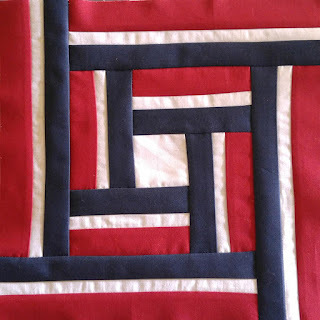 It makes you want to make a quilt in each colorway and layout. My favorite part of the Thanksgiving meal is the turkey and then the pumpkin pie. Actually they are equally my favorites as for me it wouldn't be Thanksgiving without both. Favorite Thanksgiving food--(very, very difficult as I love it ALL)--would be candies sweet potatoes with marshmallows!!!! Now you need to show a fall/Halloween colorway, even one using holiday specific fabrics. Pumpkin pie, pecan pie, lemon meringue pie ( or just a sliver of each) Love the variety of settings you used. I love the leftover turkey sandwhich with turkey, stuffing, cranberry sauce and mayo. Congrats, Debbie! You won the copy of the 100 Blocks magazine from Quiltmaker! My Favorite Thanksgiving food is pecan pie. Yum! It is a special memory for me as my mother used to make it every Thanksgiving. Since she passed away from Alzheimer's I just like to carry on her tradition. Mmm everything! But especially sweet potato pie! Congrats! I love your block!! I love it all, especially the stuffing. My favorite is Pumpkin Pie with real whipped cream topping!! Love the version on point! Makes a really unique design. My favorite food is pumpkin pie...I'm gluten intolerant so I just make the pie filling (the best part). Awesome block! I love it in the Christmas colors. Congrats on your first magazine appearance & it's a winner. I love this block, especially on point. My favorite is cranberry sauce with some turkey breast on the side. Thanks. Favorite T-day food???? well, it's got to be caramelized sweet potatoes with nuts and marshmallows, haven't had it or made it since coming to the south. Pumpkin pie, made with my mom's recipe. Great block...I find it almost hypnotic! My fave is that creamy cold pumpkin pie with whipped cream! My mom made the best! I love corn bread stuffing. So good. I love your design set on point. Very creative and different. There can never be enough mashed potatoes at Thanksgiving. Yum! I love it all -- turkey, mashed taters, corn dressing, veggies, etc., and etc. But, I got to confess that the gravy takes the cake! I drown it all (except the cranberry sauce and rolls) with the gravy. :-) Thank you for a chance to win. Favorite Thanksgiving food - sweet potato casserole (NOT the kind with marshmallows, though). I like how your quilts have a woven look when you flip some of the blocks! Wonderful block! Like how you have shown different color variations and layouts. Thank you! My favorite Thanksgiving food is stuffing. I even like it cold. I also love a family favorite, Pear Salad. yum! Delicious sounding sandwich. My personal favorite is the pumpkin pie. The only thanksgiving food I don't get tired of. Congrats, Gloria! 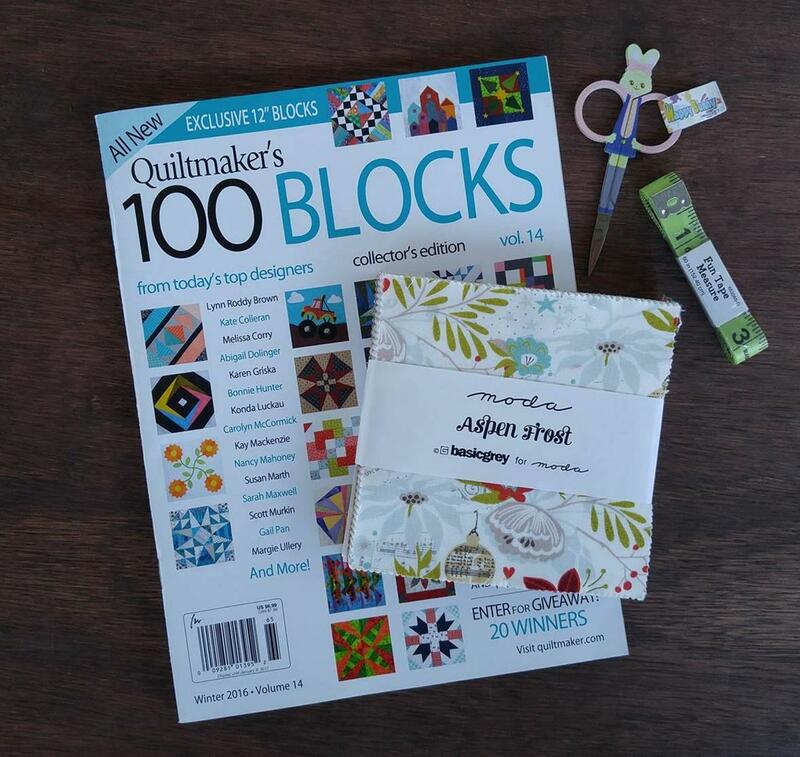 You're the winner of a prize pack with a charm pack and a copy of the Quiltmaker's 100 Blocks magazine! I love sweet potato casserole. Thanks for the fun! Love this block... almost looks like a labyrinth when many are put together. My favorite Thanksgiving food is stuffing. I make it with my homemade sandwich bread and OMG...it is soooo good! Can't wait until next week to have some! Congratulations on getting your block in the book! How cool is that?! Also, thanks for the giveaway! My favorite Thanksgiving food is the stuffing that my sister makes. Yum. Add it to a turkey sandwich with cranberries and you will be in heaven. Great block - I wonder what it would look like in baby colors or pastels. Nice block with lots of possibilities, depending on colors. You are making me hungry with all this talk of food! Mmmmmm, cold turkey sandwich, lettuce, mustard, squaw bread, with pumpkin pie chaser. we always had waldorf salad among all the side dishes ... my very favorite, for we only had it ad thanksgiving and Christmas dinners. You are so funny! Love your block, too. Congrats on a great block!! I am vegatarian - and love Hubbard squash and cranberries! wow wow wow. i just love red white blue Patriotic colors. It's almost a log cabin effect, and thanks for showing more layout fun. I love streusel-topped whipped sweet potatoes, and of course the pumpkin pie! Love the leftovers! One favorite I wish I could have again is my grandmother's stuffing. Congratulations for sure. you did a great job and I love your colors! Mine is mashed potatoes and gravy. I love the name of your block. My favorite Thanksgiving food is the Sweet Potato casserole from Susan Branch's "Autumn" book (no marshmallows". My favorite Thanksgiving food is pumpkin pie with whipped cream! Love your block! I'm Canadian so we had Thanksgiving already. My favorite is pulled pork super easy and super yummy. Very versatile block, I like it! My favorite Thanksgiving food it pumpkin pie, but the whole meal is always great. I'm with you on the leftover sandwich! Soft roll, turkey, stuffing, cranberry sauce and Miracle Whip, I'm in Heaven! Followed by a piece of leftover Pecan Pie! Turkey - we smoke them now and every bit of it gets gobbled up. From Spain.I don´t celebrate Thanksgiving but for Christmas Eve is fish, seafoods, turrón. Love you pretty block! My favorite is pumpkin pie. Could skip everything else if I have my pie! Garlic mashed potatoes with homemade chicken noodle soup and "Skinny bread"
I like it all, but right now I'm really looking forward to the dressing we make from Grandma's recipe. I'm a pumpkin pie lover, with plenty of whipped cream. My favorite Thanksgiving food would be the dressing, please pass me a second helping! My favorite Thanksgiving food is the dressing! I love the stuffing with gravy. A once a year treat. Have to go for turkey as first choice and then I love yams, or yums as our family refers to them. I make a killer stuffing, with cranberries, apples, sausage, and more. I like to eat it with bits of turkey and gravy on top. Can make a meal out of it! I'm a sucker for anything cranberry. I will eat even the canned stuff! Love the blue colorway. My cranberry apple jello salad is always a must for thanksgiving. A very neat block for red, white and blue. The E7 lay outs made the block even more special. Wow--your block is amazing--love all the setting possibilities! I'm all about the pumpkin pie! 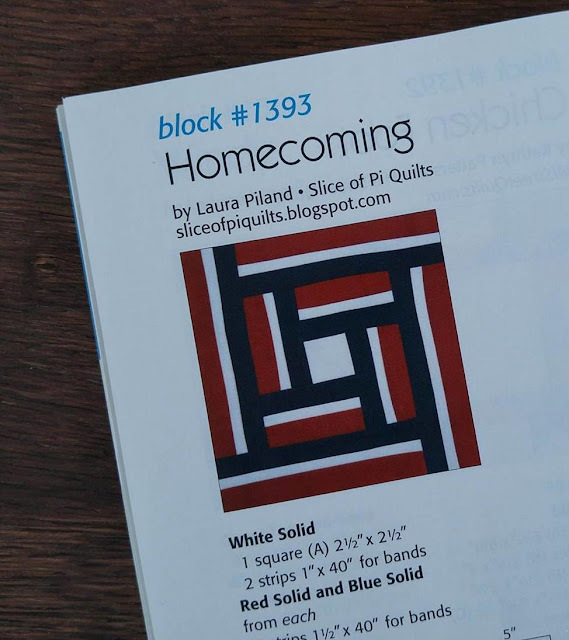 love that snowflake quilt on your page too! I don't play favorites...but stuffing is the thing I might be most sad about when it runs out. Great block...especially for those QOV's we love to make! Congrats on having your block in Quiltmaker's 100 Blocks. I love these editions. Dressing is hands down my favorite...add some gravy and I hardly want to eat anything else ;-) Thank you for the sweet giveaways! My favorite is probably the stuffing but I also love the leftover turkey sandwiches. Reminds me of when I was little and ate them with my grandmother. My favorite food for Thanksgiving is always made by my mom-no one can make her eclair dessert like she does. Made with love! I really like your block, and partial seams don't scare me! I love the different looks you get by rotating it. My favorite Thanksgiving food is stuffing - the kind my sister makes, with a bit of cornbread added to the regular bread. Sweet potato casserole...my daughter makes the best!!! And Cranberry Relish, a staple in our home at Thanksgiving. I love Thanksgiving food. It is yummy. I make a 6-cheese macaroni and cheese dish (only twice a year) that everyone including me just loves. It is not for the faint of heart (it includes cream and real butter) but it is comfort food like no other. love your block, love sweet potato casserole and the turkey of course Thanks for the giveaway! I'm a carb junkie so I must admit its the homemade yeast rolls that I run for, they are great for adding a little turkey or sopping up that yummy homemade gravy. All of it. This is the only time we eat turkey, so it really evokes a food nostalgia. I love the stuffing, cranberry sauce and pumpkin pie, sweet potatoes, mashed potatoes with heavy, and green bean casserole. Mashes me hungry. Love pecan pie. Its the only time of year that my grandmother would make it, so brings back wonderful memories. For me, Thanksgiving is all about the cranberry sauce - preferably homemade! If there is also mincemeat pie, I am officially over the moon! I love turkey and mashed potato casserole. I love your block and how you were able to show us different colors and ways to set it. It shows the versatility of the block! Great job! I love the mashed sweet potatoes with crushed pineapple. I never seem to make enough to last the next day with leftovers! Love this block for a QOV quilt! And no, if you Haven't Started it Yet that's a "Hussy" (HSY) not a UFO! Ok, for the giveaway, favorite Thanksgiving food for me (as of last year) is a Pumpkin Bread Pudding -- yum! Would also be yummy to win and get the issue! My favorite Thanksgiving food is candied yams. It is one of the few times in the year that I get them. Hubby doesn't like sweet potatoes so we rarely have them at home. My favorite food for Thanksgiving is homemade noodles and mashed potatoes. I love my grandma's recipe for cranberry sauce, it's the only kind I'll eat. Favorite is the Star of the dinner - the Turkey! Cornbread dressing of course and Carrot Soufflé. It freezes well and can take the place of dessert. Sweet block, Laura! Love the graphic secondary weaving design it makes a great QOV! Sweet potatoes are my fav for Thanksgiving Dinner, but stuffing, cranberries, turkey and cream cheese on a toasted hoagie the next day. Can't.wait. I love this block! I was going over my menu today to see what to change out, and there were some old standbys that I love and guess will make again-green bean casserole, cranberry salad, sausage filling and sweet potato casserole. I love all these blocks - I'm hoping this inspires me to sew this weekend.